Description: This is Judy Niemeyer’s 2019 Technique of the Month Class. 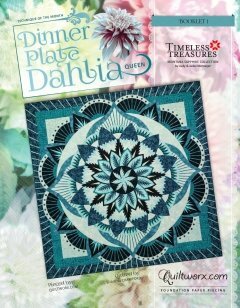 That means, in seven bi-monthly class sessions you will learn all the techniques necessary to complete, not only the Dinner Plate Dahlia quilt, but any of Judy’s previous patterns as well. This is the class you want if you are new to Judy Niemeyer’s patterns and techniques. Though the quilt looks impossibly difficult, an unlikely place to start, you’ll learn to hack it one segment at a time with Jerrine’s expert assistance. This pattern is only available from a certified instructor. Requirements: The class fee($245) and pattern fee (varies) can be divided into 7 equal payments. The large quilt pattern (98"x98") costs $120 and the smaller pattern (80"x80") costs $96. If you would like to set up payments, please come into the shop to register and sign the monthly payment agreement. Instructor Bio: Jerrine is a certified Judy Niemeyer Instructor. The instructor training is rigorous and intense, requiring the completion of several Judy Niemeyer quilts and attendance at Judy?s instructor seminars in Montana. Jerrine is both skilled and delightful. We think you will enjoy working with her to complete your project.